There is a brochures LINK ONE where you will find over 1500 products across 52 brands. This offers you the biggest selection of clothing and apparel within our industry. Our Brands for 2009 include, Regatta, Result, Slazenger, Glenmuir, Addidas, Ashworth, Callaway, Jerzees, Russell, and Fruit of the Loom, to name just a few. All these and more can be embroidered with your Logo, Club, Golf Society, Company, Corporate name or image. 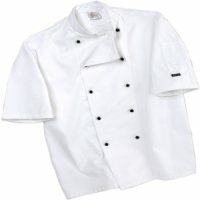 From above "Purchase Catering Clothing" can be purchased by using secure Paypal payments. If you are a company or club you may already have a logo design set up. If this is the case then a letter head or a compliment slip would be fine for us to work from. Alternatively, you may wish to email us a copy of the logo design in a jpeg format or something similar. We will also require the overall size of the logo and the colours that you require. We may occasionally need to make slight alterations to your logo to suit the parameters required for embroidery but we will be able to discuss this on sight of your logo design. If you do not have a logo design we may be able to use one of our stock logos and / or simple lettering. Please call and one of our friendly sales team will be happy to discuss what we can offer. Remember we cover all local areas of London & Kent and have a next day parcel service nationwide . We specialise in workwear, embroidered and printed clothing and men's and ladies Golf clothing and most sports. Contact us now on 01474 333 397 prostitchsales@aol.com. Please shop with confidence as this site uses Paypal.